District to District, State to State, Country to Country across the Ocean. In our business, there is no distance and time could hold us. 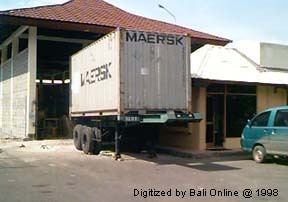 We are located in a small beautiful island: Bali, but we do big business and services world wide. Speedy safe deliver your belongings to the destination. Professionally handled by our well experienced staff. Our services cover courier service, packing, shipping, freight forwarding. We could also advise and provide anything to support your business needs such as warehouse, join venture business, export and import documentation handling, hunting for local handicrafts, garments, furniture and antiques, etc. Contact and visit us in Bali and get our best services with competitive fee. Satisfaction is our guarantee, we would never let you disappointed.